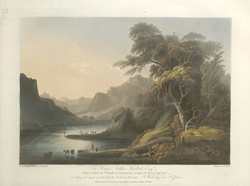 Three lakes make us the cluster known as ‘the Great Lakes of Killarney’ and this aquatint is a view of Middle Lake, also known as Muckross Lake or Torc Lake. The lake is about 1 square mile in size and is the deepest of the three lakes, reaching seventy five metres in depth at some points. Boating on this lake has been popular since the 19th century and many visitors have taken guided trips across the lakes to visit Muckross Abbey, situated on the banks of the Lower lake, and to look at the beautiful scenery.